Unless the body of the article included critical fact-based analysis of those two conflicting claims, we would be unlikely to consider the promotion of such a statement consistent with the requirements of the BBC’s constitutional basis, the Royal Charter, according to which it is required to deliver six public purposes which include “promoting education and learning” and to “build a global understanding of international issues“. In the world of Middle East politics, however, the BBC permits itself the culturally relative indulgence of promoting statements such as the following – in this case in the form of a caption to an image used to illustrate an article titled “Egypt court overturns Hamas terror blacklisting” which appeared on the BBC News website’s Middle East page on June 6th. “Hamas is designated a terrorist group by many nations, but to its supporters it is a resistance movement”. So what are BBC audiences to learn from that throw-away one-liner? The article itself (which appears to be based mostly upon information provided by news agencies) provides no factual information which would help readers reach an informed decision based on critical examination of the claims for either argument. 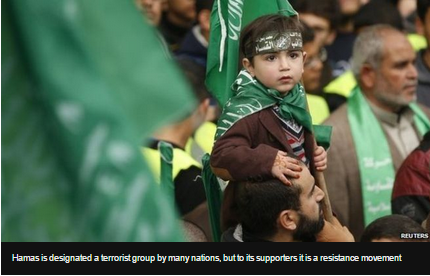 By promoting the notion that Hamas can be defined either as a terrorist organization or as a ‘resistance movement’, the BBC is therefore not only propagating a misleading, inaccurate and inherently flawed approach to the subject, but it is also mainstreaming the terminology – and the politics behind its use – favoured and promoted by the terrorists themselves. Another recent example of that phenomenon was seen in an article published on the BBC Arabic website on May 27th which informed readers that “Israeli warplanes launched a series of attacks on military positions of the Palestinian resistance factions in the Gaza Strip” [emphasis added]. Yes, Hamas and its supporters do describe it as a ‘resistance movement’ – although they are rarely open about exactly what that movement ‘resists’, particularly since Israel’s disengagement from the Gaza Strip a decade ago. A media organization committed to accuracy and impartiality would obviously take care to clarify to its audiences that whatever its political aims, the fact is that Hamas uses terrorism as the method of choice for their advancement. Likewise, a media organization obliged to meet editorial standards of accuracy and impartiality would not have published in the same article the following whitewashed portrayal of the violent coup executed by Hamas against Palestinians of other political affiliations in order to gain control of the Gaza Strip. The BBC frequently tells us that it avoids the use of the term terror because it considers it to be “loaded” and a “value judgement” liable to “raise doubts about our impartiality”. As long-time readers of these pages know, that claim does not stand up to scrutiny. Significantly, examples such as the one seen in this article provide insight into the reasons behind the BBC’s inconsistency on the issue of terror and show that the corporation’s basic approach to the topic does not distinguish between method and aims, means and ends. The result of that is that when a perceived cause is considered acceptable and justifiable, the description of the means is adjusted accordingly. Until BBC editors do indeed begin to separate the means from the ends, it will of course be impossible for the corporation to present a consistent, uniform approach to the subject of terrorism, to adhere to editorial standards of accuracy and impartiality and to fulfil its purpose to educate and inform. Superb analysis! Thank you for your work exposing the poison we are compelled to finance.